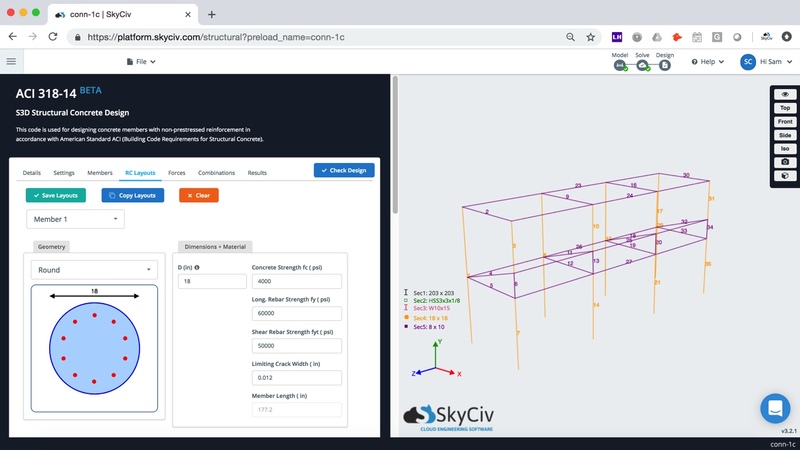 The integrated RC design module allows users to model their structure and apply loads and load combinations using our Structural 3D program. This will allow the user to (a) model, analyze and design multiple members at once (b) perform more complex and accurate analysis on the members (c) automatically import attributes such as length and section properties from the model -> RC design module. For more information on how to model using S3D – visit our getting started in S3D page. All of your members will automatically be imported from the analysis model. This includes an auto-assign of whether your members should be classed as a beams/columns as well as lengths and effective length factors. NOTE: You can edit and control any of these options at any time and your changes will be saved with your model (File – Save). In the above example, you might want to apply the same reinforcement layout to all columns. You can do this by using the blue Copy to Members button. This will allow you to copy the rebar characteristics across multiple members. Results from the analysis are automatically imported from your analysis model, so there isn’t much else required here by the user. 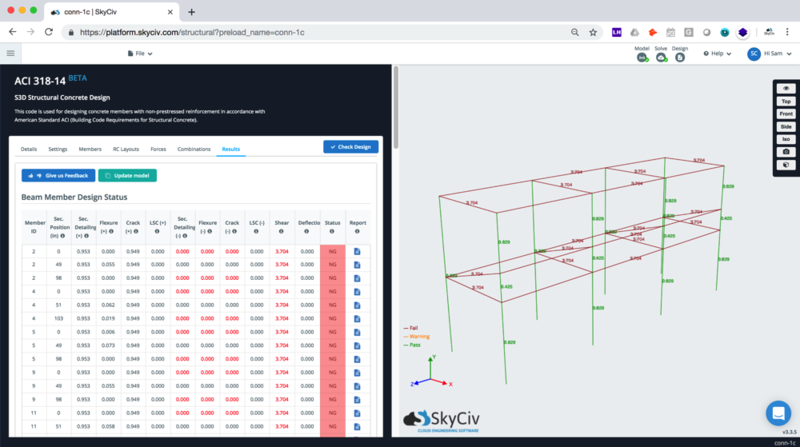 Users can review the loads under the Load tab, which will present all the check points and force diagrams (bending z, bending y, axial, shear y and shear z) which are all used in the design calculations. 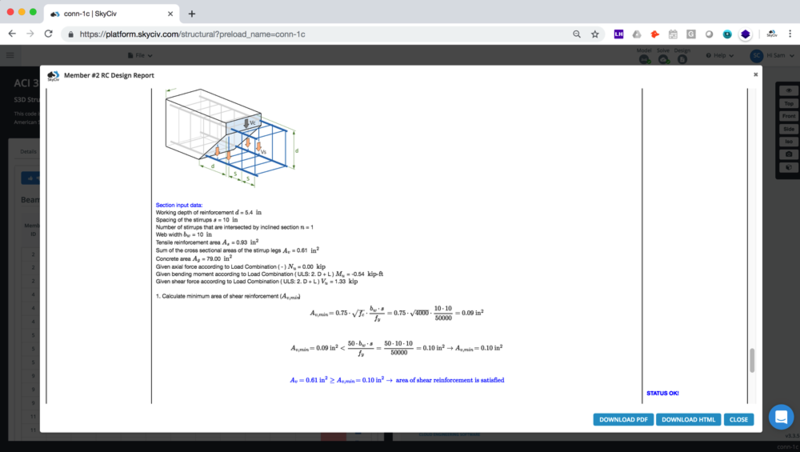 Your load combinations are also included and imported from your model – if you did not add any during the modelling phase, simply go back to Model and add load combinations, or import load combinations from ASCE, AS, EN or CSA design standards in S3D. You can also add manual load combinations from within the RC design software. Once you’re ready to run the design module, click Check Design. The results will be displayed as a table (columns = different checks and rows = the different members). Hover over the for more information about each of the design checks. On the right, the model will display a traffic-light style result – with the governing ratio showing next to the member. In the below example it is evident that the columns are passing, but the beams are failing due to insufficient shear capacity, with a utility ratio of 3.704. This ratio is how much capacity of the member is being utilized. It means the member is 3.7 times over capacity. Once solved, you can also review the full calculation reports which show the full step-by-step calculations performed by the software. 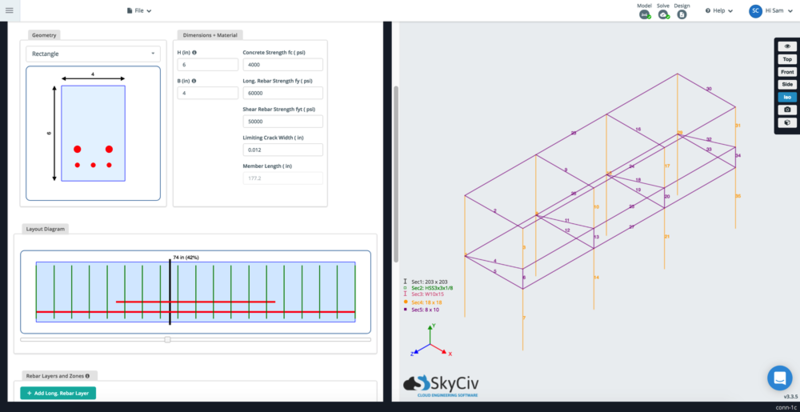 Here’s an example ACI 318 calculation report produced by SkyCiv RC design software. This helps understanding the exact assumptions, references and criteria for the design checks. This can be downloaded as a PDF to store for your records or pass on to client.